he Merion Tribute House was built to honor the men who died in WW1. We choose the Tribute House both for it's historical nature, and also because it had an exterior that looked like a castle, and interior that was grand and beautiful. 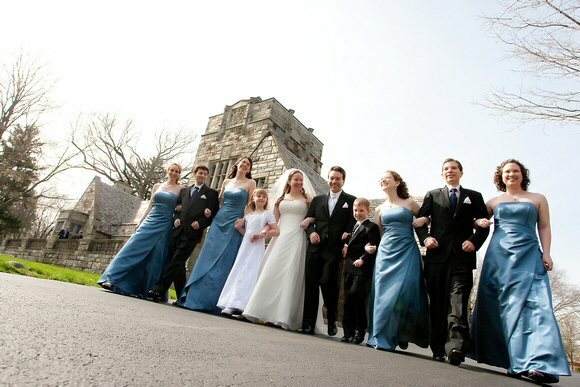 It was a perfect venue for any girl to feel like a princess on her special day. 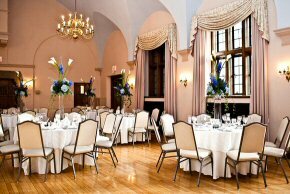 The Ball room was magnificent with it's high ceilings, beautiful chandeliers and large windows with golden curtains. The room was the perfect size for our group, seating the 10 guest tables and the head table comfortably with enough room for dancing. Everyone had a wonderful time. 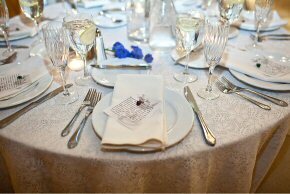 The tables had a cream table cloth with lace overlay. Each seat had a wine charm with note explaining it's significance.